Can you feel it? The days grow longer and start to heat up. The sun breaks out from behind the clouds. The smell of fresh cut lawns and garden flowers fills the air with the delicious scent of returning summer. While you plan your summer barbecue, watch your garden grow, make lemonade, and spend some time outdoors with family and friends, your skin may start to feel the burn…sunburn to be more precise. That rosy glow on your shoulders and cheeks after too much time in the summer sun can hurt for days. Relax on your lounge chair for far too long and you’ll walk away looking like a lobster forgotten in the pan. Fret not! I have a few tricks up my sleeve to soothe your angry skin. If you’re looking for sunburn relief, you’ve come to the right place. Our sun emits both warmth and visible light, but your skin doesn’t mind either of these too much. It’s what you can’t see that gets things heated up. Visible light makes up just a tiny section of the light spectrum, on either side of visible light are infrared and ultraviolet radiation. Infrared light has little effect on us, but ultraviolet radiation, know commonly as UV, wreaks havoc on your delicate skin. UV light is broken into three separate categories; UVA, UVB and UVC. UVA radiation travels deep into the skin, causing damage such as premature aging, skin discoloration and other disorders, and potential development of skin cancer over time. UVB radiation is the cause of the blistering red tenderness of a sunburn. UVB goes directly into the topmost layers of skin cells, damaging the DNA and skin tissue. That sunburn you’re wearing is a radiation burn on your skin, the result of too much exposure to harmful UVB rays. UVC doesn’t reach the earth’s surface. In most cases, a sunburn is painful, red, and hot to the touch for a few days before it starts to heal. Minor blistering and peeling may also occur. In these instances, and if no complications arise, medical attention is usually not necessary. The best treatment for the average sunburn is to avoid sun exposure until healing is underway while doing your best to soothe painful areas and stay comfortable. As the old saying goes “An ounce of prevention is worth a pound of cure.” With a few preventative measures, you can avoid a sunburn and still enjoy a beautiful summer day. Limit your sun exposure on sunny days. Even if the weather isn’t very hot, the sun can still do a number on your skin. Seeking shade is especially important between the hours of 10:00 am and 4:00 pm when the sun’s rays are most direct. Wear a hat or visor to shield your face from the harmful rays of the sun, particularly when you plan to be out for extended periods of time. Cover your skin with lightweight clothing for good coverage and protection. Apply and reapply sunscreen or sunblock according to label instructions. Choose a product with an SPF, or sun protection factor, of 15 or higher. I regularly use this one. 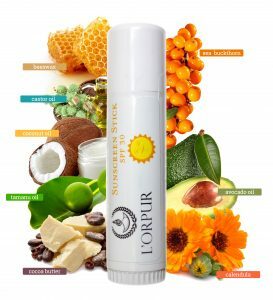 If you are looking for a natural sunscreen with organic ingredients, why not try my L’orpur Sunscreen Stick! It contains various herbs, organic coconut oil, organic calendula extract, organic cocoa butter, organic beeswax and Vitamin E.
If the damage is already done, you are most likely looking for a little relief. The worst symptoms of your sunburn will peak at about 12 to 24 hours after initial exposure and will decrease over time. You’re likely to experience some discomfort for at least the next few days. 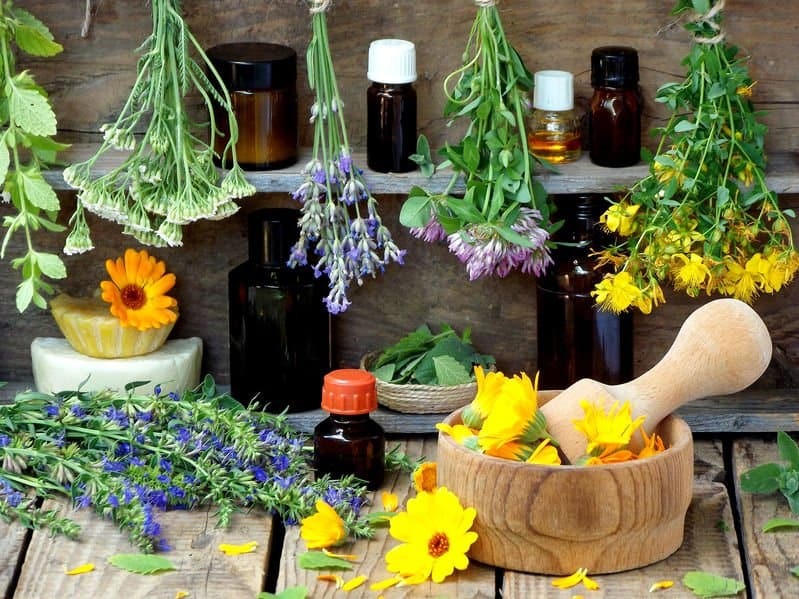 Until your skin has time to heal properly, these nine essential oils work like a charm and are ideal for keeping your sensitive skin more comfortable. Easily recognized for its lovely, calming fragrance, lavender essential oil is easy to find and is so commonly used that it is a staple in many people’s home. It contains a wealth compounds that reduce inflammation and irritation in damaged skin. Applying lavender essential oil to your sunburn improves swelling significantly and reduces redness. Neroli essential oil also called “orange blossom” is another common essential oil and has a pleasant citrus-like aroma. Its antiseptic properties make it a wise choice for preventing infection in your delicate healing skin. Neroli oil is also well known for its skin regenerating ability, perfect for preventing scarring if your sunburn is more moderate in nature. In tea, chamomile acts as a relaxant, calming the nerves and soothing away stress. Chamomile essential oil can do the same for your tender skin. When used topically, chamomile is an anti-inflammatory, and efficiently reduces sunburn related skin irritation. Peppermint essential oil has microbial properties to protect your skin from infections as it heals. It also contains menthol, which increases blood flow to the skin where peppermint oil is applied and is responsible for the soothing, cooling effect for which peppermint oil has its reputation. Tea tree essential oil is gentle enough for most people to apply directly to the skin. However, if your skin is sensitive, you should dilute it in a carrier oil before use. I use sweet almond oil as carrier oil for sunburns. Tea tree oil effectively soothes irritated skin and reduces pain caused by sunburn. Frankincense is notorious for its ability to alleviate pain when applied topically. It is also widely used for many other skin conditions as it promotes healthy regeneration in skin tissue. It is highly emollient and can provide your dry burned skin with much-needed moisture. Frankincense application encourages rapid recovery in your skin, and must be diluted with a carrier oil to be beneficial; if used neat, i.e. on its own, frankincense can worsen an already painful sunburn. Eucalyptus shares many things in common with peppermint oil, including its cooling property. Eucalyptus essential oil must be used in combination with at least one carrier oil to ensure the right dosage is applied to aggravated skin. Eucalyptus is best known for its ability to relieve respiratory issues and sinus congestion. 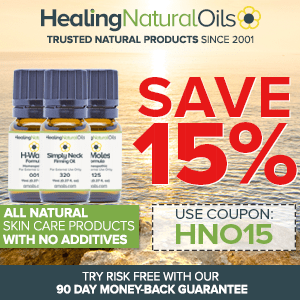 The compounds in helichrysum essential oil boost the recovery rate of skin after trauma. This oil also promotes localized blood flow where applied and soothes angry skin. It can be difficult to find, and when found can be pricey, but is still highly recommended because it is such a remarkable healing agent. A major benefit of Helichrysum is that it is so gentle almost anyone of any age can benefit from its use. I get mine from here, excellent quality but expensive. Sea Buckthorn Berry essential oil is recommended for topical use for numerous skin conditions, such as eczema, acne breakouts, dry cracking skin, and of course delicate skin affected by sunburn. Its properties promote rapid healing. Bonus Fact: In a pinch, Sea Buckthorn Berry oil can be used as a sunscreen as it gives some protection from UV radiation. When treating your sunburn, many essential oils work best in combination with one another and/or blended well with a carrier oil. Fractionated coconut oil is the ideal carrier oil for any recipe for soothing sunburned skin. It is gentle, odorless, and locks in moisture, so your skin stays hydrated and as comfortable as possible. 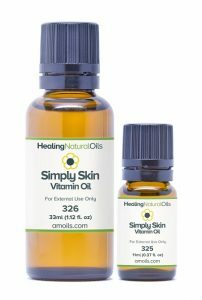 One of the products that has helped me with prompt healing and re-hydration of sunburned areas is AMOILS new product – Simply Skin Vitamin Oil. I have personally tested it and in fact I use it in my skincare routine on an almost daily basis to nourish my face and neck areas. I won’t rave much longer about it, but you can read my detailed review here. 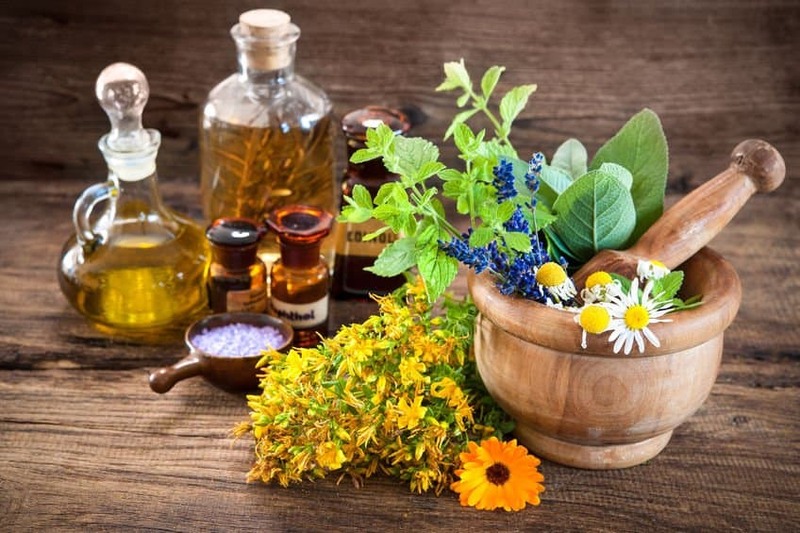 While many of the essential oils listed above work well in combination with a carrier oil, you can often increase the effectiveness of your treatment by combining a few of them for better healing and comfort. Try the following recipes and give your tender skin some much-needed relief. Combine and thoroughly blend all ingredients in a glass container, to preserve for a few days of use. Use a clean cotton ball to apply directly to sunburned skin. This recipe is safe to use as often as needed, recombine thoroughly before each use and always apply with a fresh cotton ball. Mix all ingredients until well combined and apply liberally to speed up your skin’s recovery. Mix coconut oil, red palm oil, and shea butter in a resealable glass container. If necessary, microwave mixture for 30-second intervals until it reaches the right stirring consistency. Combine thoroughly. Stir in aloe vera and essential oils. The salve may appear runny, but continue to stir and it will thicken. Store in fridge for extended use and added comfort upon application. This salve is potent; a little goes a long way! Thoroughly combine the essential oil with the carrier oil, and apply to affected areas liberally. This blend promotes healing and reduced blistering in moderate sunburns. Carefully fill the bottle with each listed ingredient. Tighten spray cap securely. Shake bottle well to combine all ingredients thoroughly. Spray on sunburned skin for pain relief and to promote quick healing. Gently stir all ingredients together in a glass bowl. Submerge a soft, clean cloth in it and wring out the excess solution, so cloth is damp but not soaked. Apply to tender skin for cooling, fragrant relief. Did you know that lavender is the best essential oil for soothing burns! Fill a tub with tepid to lukewarm water, as comfort dictates. Mix ingredients together in a glass bowl and pour into the bathtub. Spend 20-25 minutes soaking your body / skin for best results. While essential oils are a great natural way to treat your sunburned skin to some pampering, nature’s bounty offers many sunburn solutions for cooling relief and speedy healing. The first, best, and most plentiful natural remedy for a sunburn is water. If your skin is burned, it is also dehydrated from sun exposure. Spend a few days rehydrating from the inside out and drink at least six 8-ounce glasses of water each day. While water jets in the shower may cause additional discomfort, you may find taking a tepid or cool bath soothing. Spending time in the tub each day will quickly take the heat out of your skin. Aloe Vera gel is widely available and inexpensive, as well. It is extracted from leaves of the aloe vera plant and rapidly cools down over exposed skin. Many hospitals use aloe vera gel when treating burn patients because it also fights bacteria. If you have an aloe vera plant, go straight to the source for the gel. Easy to access by breaking of a leaf, aloe vera gel is ready to use straight from the plant. Administer as often as needed for comfort. Sounds weird, but it works. Potatoes applied to sunburned skin relieve pain and soothe irritation. Just slice one to two potatoes and pat as many slices as needed to any affected area for an instant soothing sensation. Dairy is notorious for taking the sting out of your mouth after eating spicy foods. The same principle applies to your sunburn. A milk bath will do the trick; just add 1-2 cups milk to your bath water to calm agitated skin. Yogurt is also effective when applied topically. Spread yogurt over affected area and let it soothe your sunburn for at least 10 minutes before wiping or rinsing away. It is a common misconception that vinegar agitates sunburn. In fact, vinegar’s acetic acid significantly reduces symptoms associated with sunburns, like pain and inflammation. Use clean cotton balls, or a soft, clean cloth to dab white vinegar on your skin. Pain relief is instant and often lasts up to 20 minutes! Summer sun and fun are the cause of many pink cheeks and sunburned shoulders. If you are nursing your skin back to health, take your time and treat it right. Use the above home remedies for prompt relief and use the nourishing, soothing power of essential oils to help you love the skin you’re in! Nice recipes! I will keep these in mind when I want a more natural approach to a sunburn. I wish I had found this at the beginning of summer when I did get burned. I ended up buying some “after sun” lotion which works great and all but it is so expensive and runs out of stock all the time. Such a pain. I would much rather make it myself. I have some of the oils mentioned above as well. I always have lavender on hand for my skin, hair, and general anxiety relief. It is my favorite EO! Thanks. You’re right, all the resources you need right here at your fingertips. Both Roman and German Chamomile are skin-friendly. 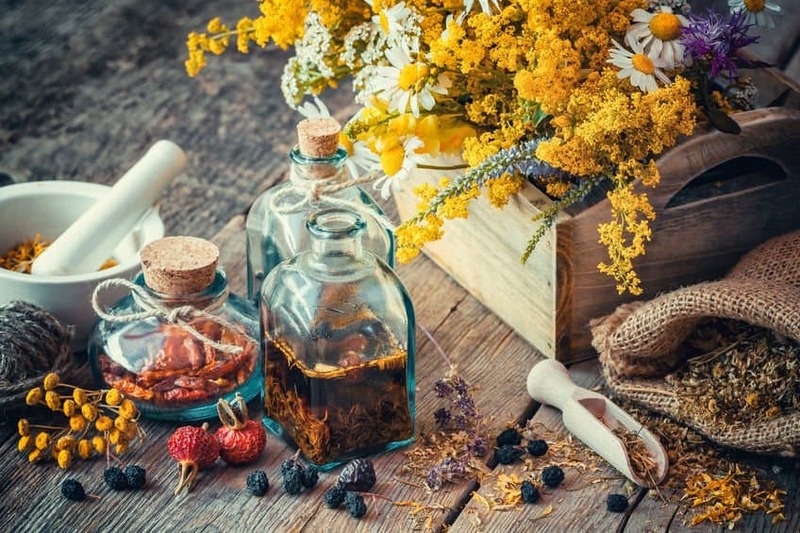 I would go with German Chamomile for skin conditions such as eczema, dermatitis and to promote healing and regeneration of damaged skin tissues e.g. sunburns. A bit surprised to see Neroli, isn’t is photo-sensitive ? I have quoted 2 different reliable sources of info about neroli and the fact that it is not phototoxic and is non-sensitizing.